So you’ve started a new story. The characters are in an interesting situation and you’ve ideas about what will happen to them. Great, stop reading this and get writing. It’s wonderful when you’re on a role, isn’t it? Ideas spilling out so fast you can barely get them written down in time. Going with first instincts can feel like an adrenalin rush. Events build to a climax, and wow, you’ve got an ending. Phew, what a feeling that is. It all worked out. Or did it? When you go back to your writing after you’ve cooled off does it still please you? The best test you can make of your writing is to attempt an impartial view of it. Ideally, we follow the principles of the best wine makers, and once the fermentation process is complete and the words are sealed in their cask, or bottles, we put them away to mature while we start work on our next batch. In writing terms, this means read other writers, or start on a new project. 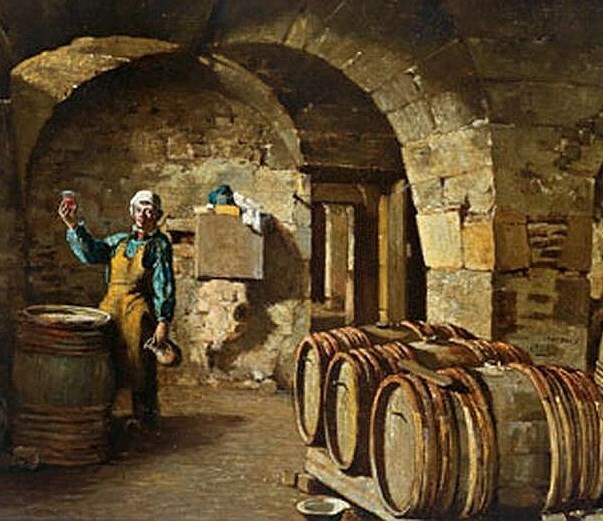 Fragment from Hector Hanoteau, (1823 – 1890) The Wine Taster. Ideally it is much, much later that we go back and taste that earlier vintage. I think we need at least a week, preferable a month (maybe several) before we get good distance. I realize that this is far from realistic. Mostly we’re creating pieces of writing for specific deadlines, and we can’t allow that kind of time. If we’re lucky someone else will proof-read for obvious errors (if really lucky, they might provide some criticism, and we might have time to consider it) and then we submit it. Considered criticism is good, you can’t have enough input from ‘ideal-readers’ (see Stephen King definition). Okay, we don’t all have access to trustworthy readers. Too many of us have only good-intentioned love ones who offer unconditional enthusiasm. For the ambitious writer though, this critique period is no time for kindness. What’s needed is the cool ruthless quest for story. Have you pushed the characters to their limits? Have you explored enough angles on the situation to be certain that the one you’ve chosen is fully exploited? It can be hardest to tell this when you are still emotionally connected to the writing. So I suggest you dig back through your files for something that is at least a year old. Ideally, chose something you either submitted, or planned to submit: something that when you see the document title, you can barely remember what it was about. What do you think of the first line? Does it make you want to read on? Are you intrigued or enticed by it? Do you care what they say? Are you happy to be spending time with them? Did you care about what happened to them? Is everything that happens in the story world believable? Or, are you irritated by how things happened? Would you be happy to recommend the story to another reader? Do you wish something more had happened in the story, even if you don’t know what it was? Clearly this is a general rather than specific approach to story-reading. Questions should arise from the text, rather than from a random list. If there is one question above all others that matters, it’s the last one. Not because I’m assuming there must be changes you should make, rather because it can help to give you confidence in your writing if you feel you’ve fully explored other possibilities. This entry was posted in Writing, Writing Skills and tagged creative writing, Critiques, reading as a writer, story, Write, writing by cath. Bookmark the permalink. This was a timely reminder for me. I’ve just resurrected a couple of stories I wrote last year but couldn’t quite get them right. Your list of questions came in very handy. Thank you. Glad to be of use. Will they be appearing on your blog?